Cub size Kraft Pinstripe Gift Bags sold by the 100 pack, are made of heavy weight paper, with a varnish stripe and have cotton cord handles. Call our Custom Print Dept. to personalize these bags with your store name or logo at 1-800-547-9727 ext. 4. These high end bags have a cotton cord handle. Sometimes called "euro totes", these bags have smooth top edge with a reinforced cuff. Brown Kraft paper gift bags have a varnish pinstripe. 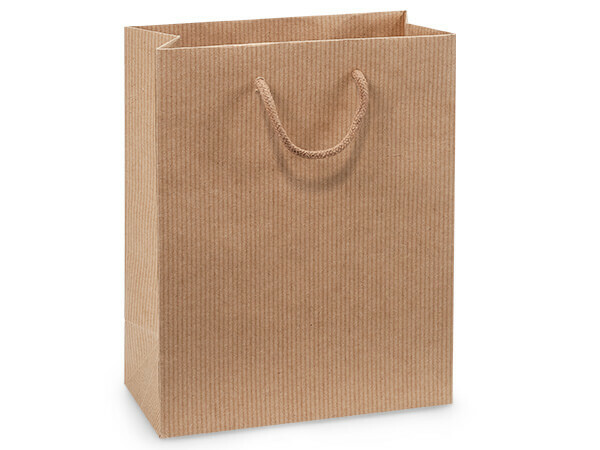 These sturdy bags are made of heavyweight kraft paper, with cardboard bottom inserts. Nashville Wraps offers a wide range of sizes, from small, medium, large and even a wine bag! These bags are great gift bags, retail shopping bags, give away bags and much more!